Allegro MicroSystems, LLC introduces a new Allegro current sensor IC that is an economical and precise solution for AC current sensing in industrial, commercial, and communications systems. Allegro’s ACS726 is the first current sensor IC to include a fully differential back end amplifier that can be used to adjust gain and bandwidth via external RC networks. The back end amplifier is fully independent and when unused, can be powered down to reduce power consumption. The fully differential output of this device gives better immunity to output offset drift as well as common mode noise. The device package allows for easy implementation by the customer. Typical applications include motor control, load detection and management, switched-mode power supplies, and over current fault protection. The device consists of a precise, low-offset, linear Hall sensor circuit with a copper conduction path located near the surface of the die. Applied current flowing through this copper conduction path generates a magnetic field which is sensed by the integrated Hall IC and converted into a proportional voltage. Device accuracy is optimized through the close proximity of the magnetic field to the Hall transducer. A precise, proportional voltage is provided by the low-offset, chopper-stabilized BiCMOS Hall IC, which is programmed for accuracy after packaging. The output of the device has a positive differential voltage (VOUTP – VOUTN) when an increasing current flows through the primary copper conduction path (from pins 1 through 6, to pins 7 through 12), which is the path used for current sensing. The internal resistance of this conductive path is 1.1 mΩ typical, providing low power loss. The terminals of the conductive path are electrically isolated from the sensor IC signal leads (pins 13 through 24). This allows the ACS726 current sensor IC to be used in high-side current sense applications without the use of high-side differential amplifiers or other costly isolation techniques. 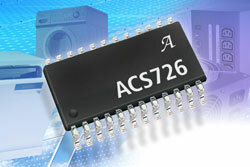 The ACS726 is provided in a small, low-profile surface mount QSOP-24 package (suffix LF). The leadframe is plated with 100% matte tin, which is compatible with standard lead (Pb) free printed circuit board assembly processes. Internally, the device is Pb-free, except for flip-chip high-temperature Pb-based solder balls, currently exempt from RoHS. The device, excluding the BAE, is fully calibrated prior to shipment from the factory.